Enjoy the benefits of ionized water without breaking the bank! The Venus is an excellent option for IonWays customers looking for a reliable, lower-priced ionizer. While new to the IonWays lineup, the Venus is already a proven performer. Featuring EmcoTech water cell technology, the Venus offers solid performance and time tested reliability. The Venus is another new addition to the IonWays family of ionizers. 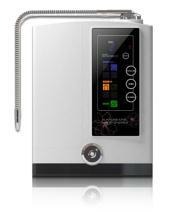 It is a value priced model, yet offers the basic features needed in a water ionizer. It’s a great way to drink ionized water from the top manufacturer – without breaking the bank! While new to the lineup, the Venus is already a proven performer. The Venus utilizes a proven water cell that has been employed by Emco Tech for over 5 years offering solid performance and time-tested reliability. The Venus controls have been designed with simplicity and ease of use in mind. A gentle touch on the buttons is all that is needed to change any setting. The new control panel is membrane sealed making it easy to clean. The Venus self cleans automatically. Once 20 liters of alkaline water are produced, the next time Venus you use your Venus it will start in cleaning mode. The cleaning mode will last for 10 seconds – during which you must wait for your alkaline water. This ensures regular cleaning of the electrodes to reduce mineral scale. This useful feature enables you to fine tune the performance by controlling the flow of water through your ionizer. It will also prove useful in helping you to achieve your preferred pH level so that you get the exact same pH level every time. The Venus is a single filter ionizer. It comes standard with our outstanding .1m BioStone filter. This filter is very effective at helping to remove many water contaminants and will produce 1000 gallons of filtered water. You also have the option of upgrading the Venus with the same filtration options that are available in other top IonWays models. The Venus has a full range of pH settings for Alkaline Acidic and of course filtered (cleans the water with no ionization). The Venus also has a special feature that allows you to select more or less voltage if you have hard or soft water. This web site is not intended as medical advice. Rather it is meant to demonstrate that aging can be slowed and even reversed and that great health achieved when the most fundamental nutritional needs of the human body are met. Always consult a medical doctor or other medical professional when you consider it necessary.